Experience a Halcott hideaway when you stay in 'Bearpen Lodge,' a 3-bedroom, 2-bathroom vacation rental cabin that sleeps 10. Perched on the hillside overlooking 125 acres of private land, this spot is perfect for those big family reunions or a peaceful getaway with friends all the same. 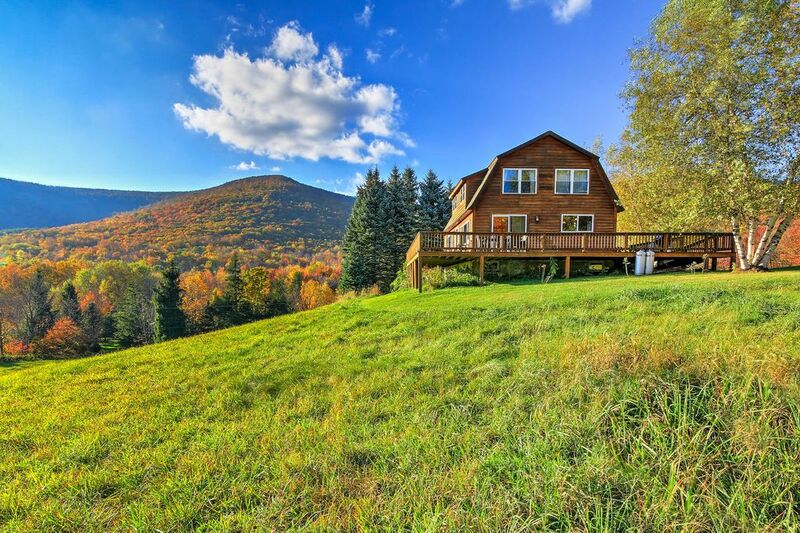 Spend the day exploring the surrounding Catskill Mountains until your cozy respite calls you back for a home-cooked meal on the wraparound deck. Bearpen Lodge is sure to treat you to cabin-living at it's finest. Find this hiker's respite in the valley of the Catskill mountains, where you can relax while enjoying the serenity of your surroundings. Wind down in the living room, where the stone fireplace keeps you warm as you check the next day's weather on the flat-screen cable TV. Refuel the family with a hearty home-cooked meal each night. The kitchen is fully equipped with ample counter space and appliances so you can cook for a crowd with ease. For some fresh air, head out to the back deck and fire up the gas grill to prepare a southern BBQ feast. Gather around the dining table which seats up to 8 to chow down while reveling in each other’s company. Bring a bottle of wine out to the wraparound deck to watch the sun setting over Bearpen Mountain each evening. The kids can use the last bit of daylight running around the 125 acres of land until tired eyes pull them back inside the cozy cabin. This cabin features 3 bedrooms to rest in before another busy day in Halcott. Turn on a movie in the upstairs bedroom as you lie back on the king bed, twin daybed, or twin trundle, while tired guests unplug and enjoy peaceful slumbers in one of the full-sized bed bedrooms. Send the adventure enthusiasts out to explore the 125-acre land that this cabin sits on. Hike Vly and Bearpen mountain to join the "3500 Catskill Club" or spend the winter snowshoeing and sledding down the rolling hills that make up this unbeatable private landscape. Bring the skis along to take the family over to Belleayre Ski Resort for easy slopes and fun-filled powder days just 20 minutes away! If you're up for more challenging terrain, drive 40 minutes to try the advanced slopes of Plattekill Mountain. Experience the small mountain towns of New York that surround Halcott. Margaretville, Andes, Pine Hill, and Phoenicia are all less than 40 minutes away - filled with restaurants, shops, festivals, and all the local favorites you won't want to miss out on! - Amenities include a fully equipped kitchen, 2 flat-screen cable TVs, free WiFi, 1 double sided working wood-burning fireplace, wraparound deck, gas grill, expansive backyard space, and much more! - Incredible Halcott location on 125 acres of pristine land in the Catskill valley with easy access to the local small towns of New York! Beautiful views, lots of land and great home!!! Adina was very accommodating. She was easy to get in contact with and allowed us to check in early. The property is private and spacious. The house is very clean and is equipped with everything you could possibly need. Fireplace, heat, showers and dishwasher all work great! Really enjoyed staying here. Would definitely come back! We had a beautiful snowy weekend! Would definitely go back!! From the moment we arrived, everything was great. the house was stocked with everything we needed and Adina was a perfect host! We were lucky to get some snowfal when we were there and skiing and Belleayre could not have been better. Great family getaway! The owners go out of their way to make you feel at home! They had everything we could have ever needed and so friendly. If there was any questions they were beyond helpful wih things to do and places to go. We loved meeting their cows at the family farm. My boys had a great time playing outside on the property one day and so close to go snowboarding another day. I was even telling my girlfriends it would be a great ladies weekend location too! If your looking to take your family to this area this is a great home choice. Adina makes you feel like extended family! The house is beautiful as is the property. Second trip here for me and my friends. Won’t be the last. Wonderful place! One of the best HomeAway experiences we had! Would highly recommend! Amazing place with stunning views and very accommodating host!